Richard Noone , The Daily Telegraph. The arrival of a large territorial male kept keepers on their toes during the annual alligator egg raid this morning. The Australian Reptile Park's oldest American alligator, weighing more than 200kg, had been defending a nesting site along with an angry mother and had attacked keepers in a boat earlier in the week. "It's unusual for males to defend the nest," operations manager Tim Faulkner said. "Brad and I were in a boat a few days ago inspecting the nests when he came over and had a go at the boat. "He's never done that before." 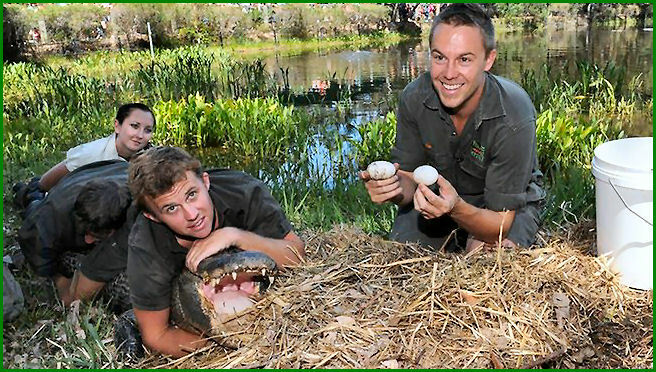 Keepers have to harvest the eggs laid by several mature females every year to prevent any hatchlings escaping the park at Somersby, north of Sydney, and entering local waterways. Mr Faulkner said it was also to prevent the harsh Australian sun from overheating and killing the eggs. Only a handful of eggs are later incubated by the park based on requests from other zoos around the country. The rest are sent to universities and museums for research. "These eggs were laid either last night or the night before," Mr Faulkner said. "It's critical that we get in there straight away to remove the eggs because the Australian sun is too hot and once it hits that nest they overheat and actually die rather than incubate." 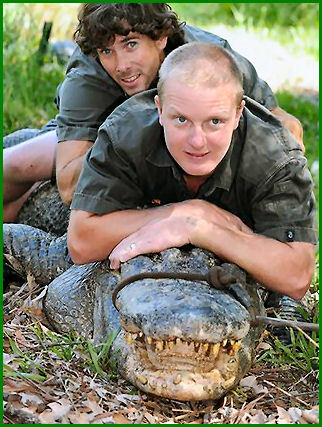 In a dramatic operation that staff said was as dangerous as anything they do at the park, which also houses collections of Australia's most deadly snakes and spiders, Mr Faulkner lured the mother far enough away from the nest for three other keepers to jump on its back. Two more keepers had to jump on the large male when it crept out of the water and came close to charging. His top jaw was tied to a tree "otherwise he'd just stand up and carry the keepers off into the water" Mr Faulkner said. "We can tell when the females have laid their eggs because there's an instant change in behaviour from a gator that sits in the water to what all crocodilians do and that is defend that nest with their life," he said. "This year's harvest has been a few weeks later than any we've ever experienced and we believe that was just because we had a very cold, wet start to summer and alligators being reptiles require that beautiful warm sun to warm up to cook their eggs and incubate their eggs." Keepers collected 45 eggs, which is about an average clutch in the wild but a good sign for a female in captivity.